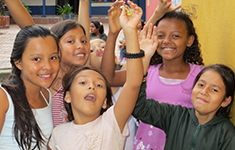 Work with 170 children at the Hogar Bohío de María in Bello, Colombia. 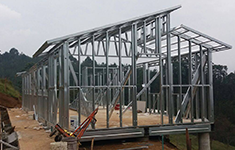 Help with the construction of our new Hogar de Cristo in Caldas, Colombia. Shop online at your favorite stores and iGive donates part of what you spend to The Emiliani Project. 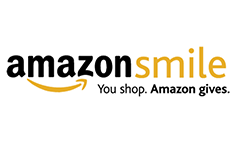 Use AmazonSmile and 0.5% of the price of your eligible purchases goes to The Emiliani Project. New Home Restaurant Construction Begins! The Emiliani Project has begun construction of the kitchen and dining room at our new children’s home in Caldas, Colombia. Building materials have been arriving over the last week and the crew is set to begin constructing the floor of the building this week. 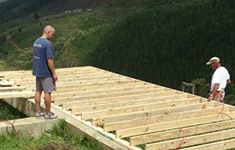 We are very excited to have the new building ready for our volunteers to construct in our July mission trip. The Emiliani Project wishes you, your family and friends a very happy Independence Day! As you head to the beaches and BBQs to celebrate, consider that the United States is ranked #1 in charitable donations as a percentage of gross domestic product. Not only is the U.S. the greatest country in the world, but also the most generous. Happy 4th of July! 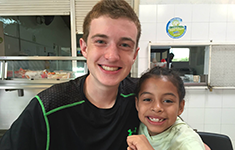 All of our Mission Trips offer you the opportunity to work with our kids, participate in the daily operation of the home, roll up your sleeves and work at our new home construction site, and to just have some fun with the children while experiencing the beautiful country of Colombia by taking them to local events, festivals and activities. It’s an opportunity to really make a difference in the lives of children who need your help while at the same time making a positive impact on your own life. For more information about our trips and to register for an upcoming Mission Trip, please visit our Mission Trips page or email us at [email protected]. If you drink coffee or know someone who does, then please consider The Emiliani Project coffee as a great way to drink specialty coffee while you support a great cause. We import Colombian coffee grown by farmers local to the area where we work with our kids. Volunteers here in the U.S. roast it, bag it and help us distribute it all over the country. 100% of the proceeds of the coffee goes directly to support our kids and the construction of our new children’s home. We offer three roasts: medium, full city plus and dark roast. Each of our roasts has the image of one of our kids on the front of the bag, along with their individual story on the back. It’s specialty coffee, so it’s some of the best…and it makes a great gift! You can buy our coffee in our online Coffee Store. If you’re interested in learning more about how you can help us market and distribute the coffee, please Contact Us or send us an email at [email protected]. We’d love to have your help. Remember, we are a 100% volunteer force!